Name: Vitale II Acrylic Modern Freestanding Soaking Bathtub 67"
This elegant acrylic modern bathtub comes fully equipped with an over flow, pop-up and drain. 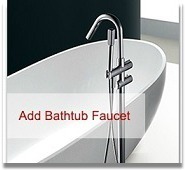 The classically tapered outline of this bathtub compliments a wide variety of decorating styles and tastes. Likewise, the sloped interior will comfort your backside as you are able to rest throughout a satisfying bathing experience. This acrylic modern bathtub is fully finished on every side ensuring your design options are endless. The Vitale II freestanding bathtub brings you beauty and practicality all in this gorgeous model soaking tub.